I’ve had a week to source tiles for three bathrooms, a downstairs loo and a laundry room. There are hundreds of beautiful tiles out there but very few of them can be classed as eco-friendly. I got excited when I stumbled on Eco Friendly Tiles who supply tiles containing recycled content with carbon neutral assurances, but unfortunately they only supply large, commercial clients at present. Alusid is another British company making a name for themselves in recycled, sustainable surfaces. They take materials destined for landfill within a 120 mile radius of their factory and turn them into a variety of unique, textured surfaces for both interior and exterior walls. Instead of using resins or concrete to bind their materials they use low temperature heat. I’m keeping these as an option for one of the walls of our industrial-style kitchen but it’s not the right look for the older parts of the house. If you’re prepared to source from the States then the choice for eco-tiles is far greater. 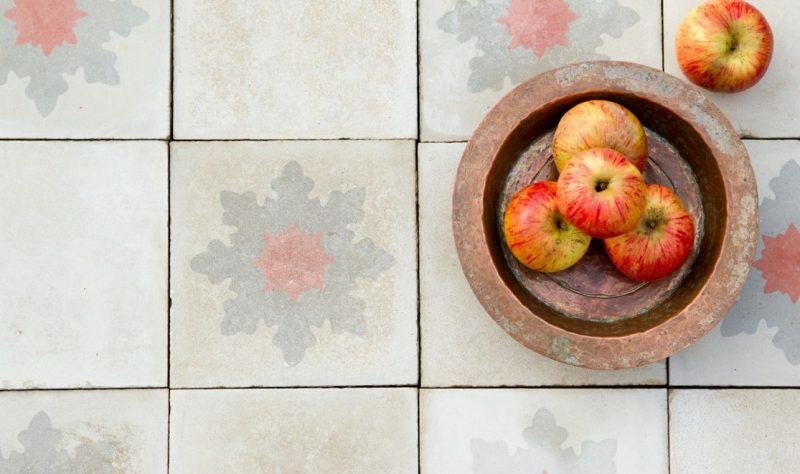 A particular favourite is Fireclay Tile, an inspiring, family-run Californian business who make tiles with as high as 70% recycled content derived from glass bottles, TV screens and discarded porcelain basins and loos. The colours and styles are so in-vogue though that you’d never guess their humble origins. But, with no UK tile manufacturers meeting my needs I started to look at reclaimed tiles. Going down the reclaimed route is rarely a cheap option and to spend this sort of money I needed to be inspired. Chris from Maitland & Poate provided inspiration and enthusiasm in double doses. He and his wife started sourcing tiles purely for their own renovation project but quickly spotted the market for a product which combined the growing trends of bold, geometric design with reclamation/salvage. They now scour old buildings and reclamation yards around Cadiz and Seville for encaustic tiles (some of which are 150 years old) and ship them back to London where they painstakingly sand and polish them. Chris has a brilliant eye for design and will help devise striking tile arrangements. Their stock is extensive and constantly changing so there’s little risk of seeing the same tile in a house down the road. Thanks to Maitland & Poate I’m now the owner of 176 sello and rojo oscuro tiles (see below) reclaimed from a hacienda in Osuna, Spain which will grace the floor of our downstairs loo. I love the idea of juxtaposing Moorish-influenced tiles from Seville with the Georgian architecture of our house. For those truly dedicated eco-warriors amongst you, there’s something called Tadelakt which is an ancient moroccan technique for creating polished plaster using natural, lime-based materials. Mike Wye Associates supply the lime plaster, natural pigments and tools for the task but then you’ve got to either find the budget to employ a Tadelakt specialist or the time and determination to learn how to do it yourself! Source ultra-thin, stone-effect porcelain tiles rather than using real marble, limestone or granite. New technologies enable porcelain tiles as thin as 3mm to be manufactured using fewer raw materials and with greatly reduced transportation costs. In addition, porcelain tiles don’t need toxic sealants to protect them from stains and water penetration. I’ve been around the houses searching for the best carrara marble look-alike and I’ve opted for Mandarin Stone’s mimica carrara which comes in a whole variety of tile sizes including as large as 1m x 0.6m. If you choose to use a natural stone then pick one that’s quarried as close to home as possible. Marbles and granites sourced from India and South America not only have greater amounts of embodied carbon but they’re quarried under far less stringent environmental and human rights laws than in Europe and North America. Earlier this year both John Lewis and Habitat stopped supplying a range of granite worktops from India amidst allegations of slavery and child labour. Set tiles as close together as possible because this minimises the amount of groat used and also reduces the build up of mould and staining. Keracoll produce grouts and tile adhesives that are solvent free, have low CO2 emissions and contain recycled materials. They are manufactured in Italy and are suitable for porcelain, ceramic and glass tiles as well as all natural stones. Are eco paints worth the price?